The purpose of the Eastman Students’ Association (SA) is to act as a liaison between the undergraduate students and the administration; to provide a support structure for student activities; to provide social activities to enhance and enrich student life; to promote the cultural, social, and physical well-being of undergraduates; to protect the academic and non-academic rights of students; to ensure quality educational standards, facilities, and teaching methods within the school; and to provide a forum for the expression of student views and interests. The Eastman Students’ Association is advised by the Office for Student Activities. The SA and the Office for Student Activities act as liaisons between the Eastman School of Music and the College of Arts, Sciences, and Engineering (commonly referred to as “The College” or the “River Campus”). In addition to the student organizations at Eastman, students have the opportunity to join any of the student organizations at the College. 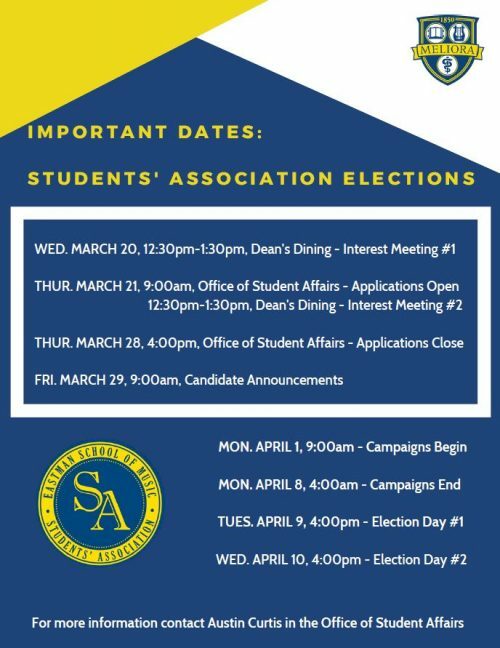 Students who are interested in joining an Eastman student organization, creating a new student organization or joining one on the River Campus are encouraged to speak with the Eastman Students’ Association President or staff from the Office for Student Activities. Campus Community Connection – An online database of clubs and organizations at the College. The SA Elections are coming up. Check out the SA Elections Calendar for important dates, interest meeting times, application deadlines, and other important election information.